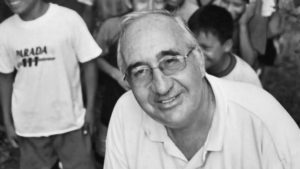 LIMA, Peru (CNS) – A Spanish Jesuit priest who was found murdered in the boarding school where he lived was buried Aug. 12 in Chiriaco, in the Apostolic Vicariate of Jaen in Peru’s northern Amazon region. Mourners carried Father Carlos Riudavets’ coffin through the streets of Chiriaco and jammed the small community’s simple church for the funeral Mass. A cook found Father Riudavets’ body Aug. 10 at the Jesuit residence on the grounds of Valentin Salegui School, part of the Jesuits’ Faith and Joy school network. The 73-year-old priest had been bound and the body showed signs of violence, according to a statement from Peru’s Jesuit community. Father Riudavets, a native of San Lucar de Guadiana in Spain’s Huelva province, had worked in Peru’s Amazon region since 1980, serving as a teacher and later principal of the school. Although retired, he continued to live and assist there. The school, in the community of Yamakai-entsa, serves about 270 Awajun and Wampis indigenous students from villages along five rivers in the region. No students were there at the time of the murder because the school was closed for mid-year vacation. Peruvian media reported that police wanted to question a former student who had been expelled from the school, but the bishop said the circumstances of the murder are still unclear and the Jesuit community is awaiting the results of the police investigation.